As a leader in the field of planning, Frazier Associates specializes in creating design guidelines that reinforce community character. Branding, image, and identity are rapidly becoming part of a common vocabulary for local governments. Every community seeks to highlight their unique characteristics in the economic development and tourism marketplace. The actual appearance of a town, city, or county creates a real sense of place- from gateways to corridors to downtowns, what people see is critically important. A commitment to design quality that results in an attractive place to live, work, visit, and do business conveys a positive image about your community. An important tool in maintaining community aesthetics is the creation of a local design review body and accompanying design guidelines. Frazier Associates’ team of planners, historic architects, historians, architects, and graphic designers provide a contextual approach in the unique field of writing design guidelines for communities. Our work ranges from design guidelines for entire communities to distinct areas within a locality. 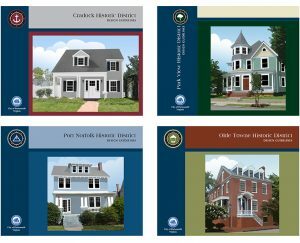 Guidelines may be developed for historic districts, downtowns, neighborhoods, campuses, rural areas, villages, or suburban neighborhoods. Strategic management of corridor growth and relating it to overall community character can also be accomplished through design guidelines. In creating design guidelines, our approach is to form a partnership with community leaders and officials, obtain stakeholder input and participation, develop a new community vision, and respond to local design and development issues. We offer extensive experience in research, guidelines development, and graphic design, as well as in facilitation, public education, and participation of all stakeholders in the process. We use The Secretary of Interior’s Standards for Rehabilitation in all of our design guidelines work for historic downtowns and neighborhoods. Frazier Associates takes pride in delivery of top-quality end products, from clearly written documents to effective presentation materials. We believe that a quality product is achieved only by a clear and effective partnership with the community, by being good listeners, and by creating design guidelines that respond to the unique design issues and reflect the architectural character found in each area covered. Our in-house graphic designers ensure that our clients receive a professionally designed, graphically rich, and easy-to-understand final design guidelines document that is adaptable for print, digital, or web applications.